As noted previously, this is an advanced detox, and is highly recommended to perform the Colon Detox & Intestinal Cleanse before you attempt this detox. For the products needed in this Detox, the Liver Tincture and Liver Flush Tea can be purchased at Baseline Nutritionals®. They sell a full detox kit. 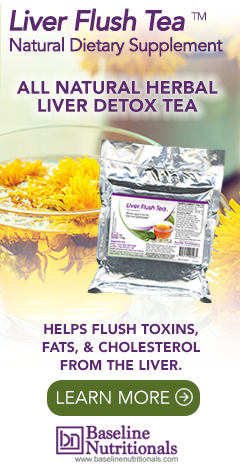 Liver Flush Tea™--The tea helps with the flushing process itself, but also helps minimize any discomfort or nausea. The key herb in the tea is dandelion root, one of the strongest herbal lipotropics known. That is to say, it flushes fat deposits from the liver. Other herbs that you will find in the tea include things like: ginger, clove, cinnamon, burdock root, and horsetail. Incidentally, some of the other herbs used in the tea (such as uva ursi, parsley root, and juniper berries) are also extremely beneficial to the kidneys. Several cups can and should be consumed throughout the day. In fact, consuming the liver/detox tea as a regular part of your diet is a pleasant and tasty way to continually optimize your health. Liver Tincture™--contains herbs like dandelion root, ginger root and garlic, which provide nourishment to help the liver rebuild and regenerate itself. A secondary benefit is that it will reduce the liver's release of low-density lipoprotein (LDL) cholesterol, the bad kind. In addition to all of the herbs that support and cleanse the liver, this liver tincture also contains the antiparasitic herbs Wormwood and Black Walnut – parasites hate those herbs. Potassium Broth--this is a clear soup broth made at home that's high in potassium due to the potato skins. Its main purpose is to make sure that potassium levels stay high to minimize any chance of your heart rate speeding up while you are fasting and losing electrolytes (why water fasting is so dangerous). The broth is also high in garlic to help cleanse the liver and further drive parasites from your body. Morning Flush Drink--this blended drink of juice, lemon, garlic and olive oil is the heart of the program. The way the liver detox works is that you starve your body of fats all day. This allows bile to build up in your liver and gallbladder. Then, in the morning of each day, you have the morning flush drink which contains your only fat of the day (the olive oil). This causes the liver and gallbladder to literally "wring themselves out" in an attempt to deal with the oil--squeezing out accumulated fat, cholesterol, softened gallstones, and toxins in the process. The purging action gets progressively stronger each day of the flush. Fresh Juice from Juicer--it is extremely beneficial to incorporate a two-day raw food diet and 3 day juice fast (or 5 day juice fast) into your 5 day liver detox. In any case, avoid all fats to maximize "the wringing effect" of the morning flush drink. You can drink as much fresh juice as you want on this detox, so don't skimp on the juicing ingredients, and be sure to check the juice recipes before you go to the store. Any combination of all vegetable or all fruit will do. One exception is a juice made of 1 large apple, 1 stick celery, ½” piece of ginger, and enough carrots to make 20-24 oz of juice. If you are interested in weight loss and/or concerned about blood sugar, drink more vegetables juices rather than fruit. If diabetic, you will want to tend more to diluted pure vegetable combos (avoiding beet and carrot), and back off from the fruit juice based drinks. Blood Support™ (Combine This Detox with Detox 5)--this tincture works to purify and optimize the blood, cleanse your liver, kill viruses, balance blood sugar, and help repair cellular damage. Note: all of the above formulas are available from Baseline Nutritionals®, and all of the instructions in this phase apply specifically to those formulas. If you have other formulas from another company that you prefer, go for it. Just adjust your use of those formulas according to the instructions that come with them. 4 Organic garlic bulbs should provide enough garlic for your morning drinks (15 cloves over 5 days) plus 50 cloves for your potassium broth. Fruit for Juicing. If you want something refreshing during your detox, juice fruit. Buy enough organic fruit to juice for 5 days such as apple, pineapple, pear, strawberries, any citrus fruit, papaya, cantaloupe, kiwi, etc. Just keep it organic if possible (you are detoxing)! Sun Chlorella, ten 3g packets for added protein, energy, detoxification, and elimination. Chlorella can aid the body in breaking down persistent hydrocarbon and metallic toxins such as mercury, cadmium, lead, DDT, and PCB while boosting the immune system response. Chlorella is also alkaline and helps balance your body's pH. Note: If you are allergic to chlorella, you can use virtually any other pure green food such as spirulina, barley grass, green kamut, etc. However, although they provide simple protein, they do not provide the same detoxing action. One other thing that might help is to use Glucotor® v.2 sold by Baseline Nutritionals®, which will minimize the glycemic response. Print the Daily Detox Diet Chart and have ready on counter. Review all the juice recipes you want to make and plan out your daily juice meals. Go shopping. You may be able to purchase all your grocery items from one store, like Whole Foods. If not, your local grocery store and local health food store should have all these items. Wash all of your fruits and vegetables. Get your juicer out and ready to use. Put all your supplements away except colon corrective, tinctures, and tea. You can also continue with probiotics and digestive enzymes (with your juice or salad to facilitate digestion). Prepare Liver Flush Tea™. At night, before bed, using a big 8-quart Dutch Oven pot, add 4-5 Tbsp. of Liver Flush Tea to the pot and fill to brim with filtered pure water. (the water does not have to be exact or measured) Let it soak overnight. Upon rising you will simmer and drink throughout the day. If you are looking for a lighter version of the Liver Detox that does not involve fasting, there is a slow and easy version that will give you 70-80% of the benefit without the difficulty. As part of your daily diet, just eat one cup of freshly grated beets mixed with olive oil and lemon juice for 30 days straight. Daily use of the Liver Flush tea is required and one bottle of Liver Tincture is highly recommended. Can the water being used be spring water? I can not download potassium broth nor morning drink. All other downloads working. So not want to start detox without those please email them. Our Potassium Broth and Morning Flush recipes can be found on this page. Simply print this page: https://jonbarron.org/liver-detox-blood-cleansing-recipes-natural-program. I have a mitral valve prolapse and have arrhythmia every so often. Is here any risk with the potassium broth? Thank you so much for the quality products and information. Regarding the liver detox I have two questions. 1. 30 days alternative liver detox could you please give me quantities and method, and also how to combine it with the tinctures and liver teas. 2. Is there an alternative for the grated beets for diabetics during the 30 day liver detox. where do i find the lighter version of the Liver Detox that does not involve fasting, there is a slow and easy version that will give you 70-80% of the benefit without the difficulty. You found it, right at the bottom of this page. I am allergic to garlic. Are there non garlic options? If you are allergic, just leave the garlic out. The other ingredients still have many health benefits. Thank you so much for very informative site and sharing all the information on the web site I sined up. How much olive oil and lemon juice I should take in Alternative Cleanse ? And should I take on empty stomach?